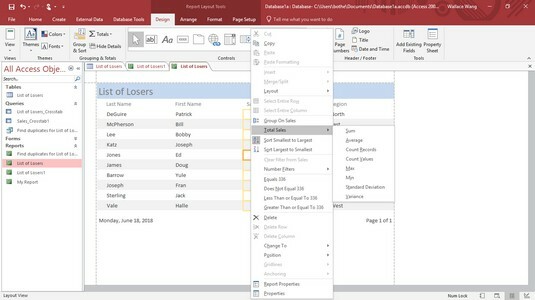 After you create an Access report, you can manipulate the data displayed in that report, such as sorting data in ascending or descending order, changing from portrait to landscape (or vice versa), or applying a filter that displays only data that meets a certain criteria. By using an Access report, you get a different view of your data. By manipulating the data in an Access report, you create alternate views of the same report. Some common ways to extract information from an Access report include counting, sorting, and filtering. In the All Access Objects pane (the left pane of the Access window), double-click the report name. Access displays your chosen report. Click the Home tab. In the Views group, click the downward-pointing arrow below the View icon. Access displays your report in Layout view, which highlights an entire column (field) at a time. Layout view highlights a single column of your report so you can manipulate the data in the highlighted field. To make reports more useful, you can have Access count and display information. For example, you might want to know which products are selling the best or the total dollar amount of each sale so you can tell exactly how much money your company made during March. By counting records or adding up values stored in fields, Access can help you better interpret the data displayed in a report. Switch to the Layout view of your report by following the steps above. Right-click in the column (not the column heading) that you want to count. Access highlights your chosen column and displays a pop-up menu. Right-click a column to display a pop-up menu for manipulating your data. The menu command displays the Total command along with the field name you right-clicked, such as Total Last Name or Total Sales. Access displays a submenu that displays Count Records or Count Values. Choose either Count Records or Count Values. Access displays the total count in your report. If you choose the Count Records or Count Values command again, you can hide the total count in your report. Right-click in the column (not the column heading) that you want to sort. 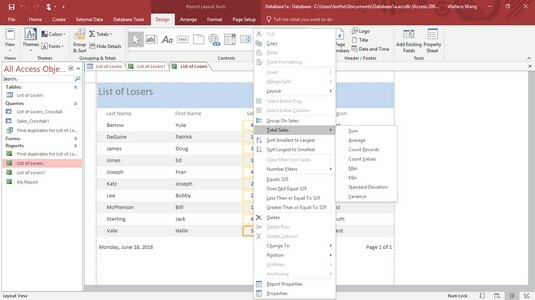 Access sorts your chosen data in your report. Filtering tells Access to display only data that meets a certain criterion, such as a fixed amount. For example, if you have a report that lists all the sales of products, you can filter your report to show only those products that sold over $1,000. Switch to the Layout view of your Access report by following Steps 1 through 3 above. Right-click in the column (not the column heading) that you want to filter. Choose a filter, such as Text Filters or Number Filters. Depending on the type of data your column contains, the Filter command may appear as Text Filters or Number Filters. A submenu appears. The Filters command displays a submenu of different criteria you can choose from. Choose a filter criteria, such as Sum or Average. Depending on the criteria you choose, a Custom Filter dialog box appears. In the Custom Filter dialog box, type your criteria, and then click OK.
Access applies your filter to your report. You can always turn off your filter by clicking the Home tab and then clicking the Toggle Filter icon in the Sort & Filter group.